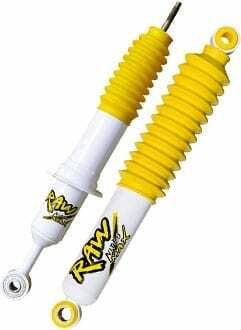 RAW 4×4’s Nitro Max Shock Absorber line-up is excellent for all offroad, work and mining vahicles. They survive the toughest conditions with ease. 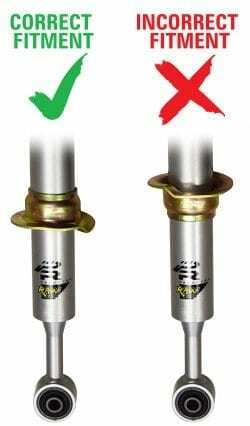 is a heavy duty gas shock absorber that will improve ride quality by reducing body roll and increasing vehicle stability. 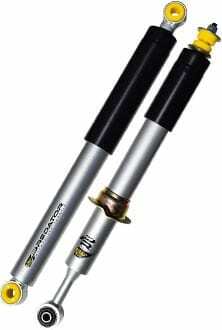 is the heavy weight contender of our shock absorber range. RAW RFX utilises a robust 3 way adjustment design and a large 41 mm bore size, where you can choose the ride to meet your needs and application. 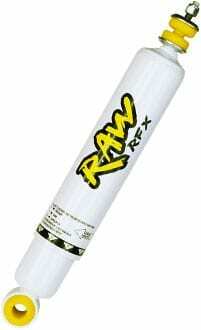 RAW 4×4 Nitro Max is the heavy weight contender of our shock absorber range. Specifically designed for heavy coil sprung and torsion bar vehicles, Nitro Max uses a proven truck shock absorber design with highly tuned valving for 4 x 4 applications carrying heavy loads and travel demanding terrain. Recommend for vehicles used in mining, long distant touring and heavy duty applications. Heavy duty bonded rubber lower bushes to support the weight of the vehicle and provide additional articulation. The RAW Predator range brings together on road prowess and off road durability into a fast acting monotube design. The Predator delivers that elusive feeling of comfort and control. If you use your 4WD for day to day running around and off road adventures on the weekend, the Predator is what you are looking for. The Predator series has been specifically designed using mono tube technology for the 4×4 owner who is looking for that sometimes elusive combination of comfort and control. The design of the Predator is one of the most efficient heat dissipating shock absorber designs due to the single wall construction resulting in consistent performance on & off road with sharper steering response, less body roll and improved traction. If you use your 4WD for day to day running around and off road adventures on the weekend, the Predator is what you are looking for. Increased rod diameter for coil over shocks. 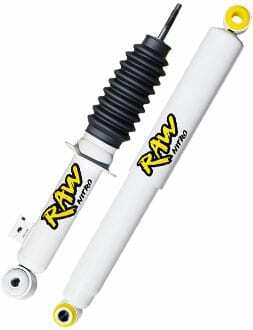 All coil over shock absorbers now have an 18mm diameter piston rod for extra strength and durability. One of the largest bore sizes on the market. The Predator monotube has one of the largest bore sizes on the market at a massive 46mm in diameter. This helps the shock stay cooler for longer under extreme working conditions. Heavy duty low friction seal package with a larger bearing surface has been added to the Predator design. 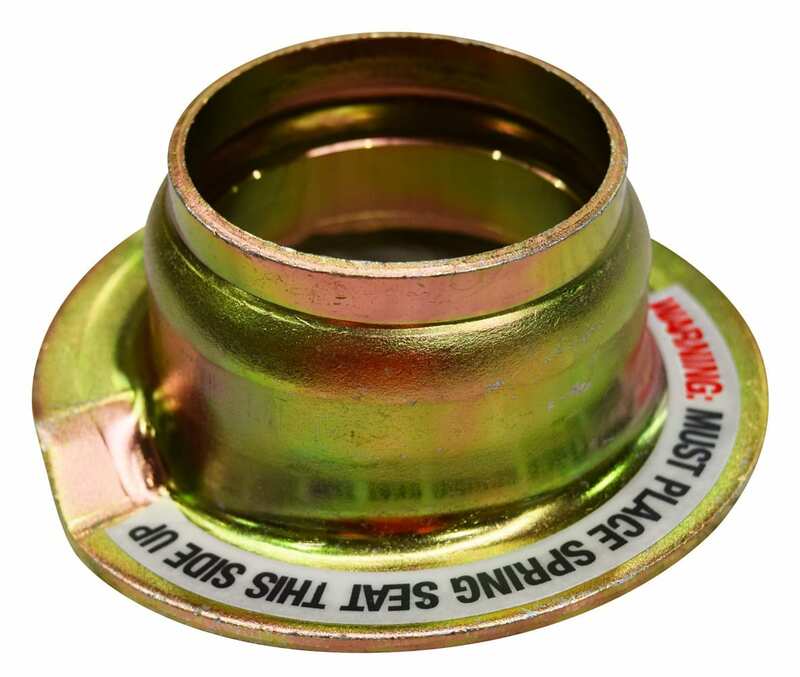 This helps withstand additional side load in hard off road conditions and retain oil under extreme temperatures. Bump cap & wiper seal designed to keep dust and grime out. Alloy floating piston separating the oil from the gas inside the shock absorber. 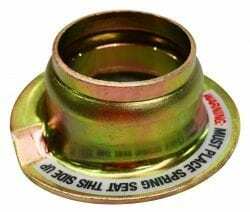 This component has been manufactured to be lighted and stronger improving overall response time & reaction speed of the shock absorber. With a large body diameter for extra oil capacity and various other heavy duty features, RAW RFX is ready for your adventure. To ensure that the RAW Predator struts are fitted correctly please read the following instructions for safe fitment to the vehicle. Ensure that the installer has read the applicable fitting instructions (see image on right) provided in the strut packaging before installing the coil and top hat. 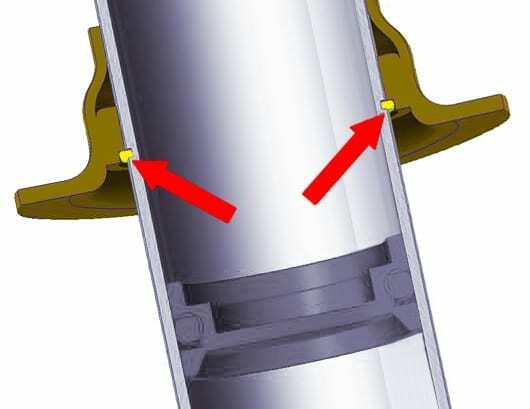 The spring seat collar needs to be located on the circlip correctly with the recess fitting securely on the circlip as indicated by the red arrows in the cross section diagram on the left. (The cross section of the circlip is indicated in yellow in this diagram). IMPORTANT: It is critical for installation and to avoid serious injury that the spring seat is installed the correct way up as shown below. Each spring seat is fitted with a warning sticker (as shown here).